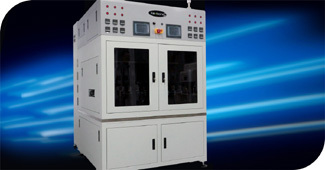 The Flexbond™ high-throughput hot bar bonding platform enables the first fully automated volume solution for advanced flex circuit and other hot bar interconnect applications. It combines with Universal Instruments’ Fuzion® Platform for full-process integration, including flux transfer, high-accuracy placement and hot bar soldering. These configurable solutions have been shown to provide 6X to 12X the throughput of traditional semi-automated assembly stations and more than twice that of alternative automated hot bar solutions while reducing floor space requirements by 80%. They also require significantly fewer machines and offer the lowest OPEX and $/cph/m2.